That is beyond awesome! Hmmm......now I have a chair that needs attention. Hope you don't mind if I Pin this? Hi Maureen! Thanks for stopping by! Pin away! thanks for sharing! Have a great week! GORGEOUS MAKEOVER. I would never have thought of this. Gotta try it now. Candy, thank you, thank you! Have fun...it was a lot of fun seeing the "ugly" go away. Thanks for following! This is amazing! First I love brown and blue anything and it looks like leather. 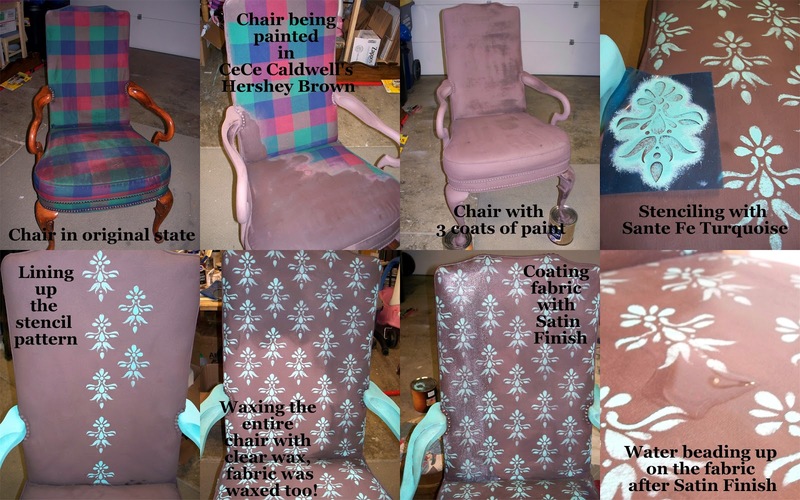 Do you think this paint would work on peeling and distressed vinyl chair? I would love to know. Pinning this for future reference. Thanks for sharing! Joselyn! Thanks you so much! I will have to jump over and check out "The DIY Spot". I have not tried it on vinyl yet. Not sure how it would stick? I would recommend priming the vinyl with a glossy surface primer like Zinsser 123 and then you could definitely paint it with the CeCe Paint. Just know the texture of the cracks and peels in the vinyl will still be there. Then proceed with the rest of the steps. On the vinyl, I would skip the waxing step and just go straight to the satin finish. If you decide to to this, please post to our Facebook page! Would love to see the results. Thanks so much Christine! Shared at the DIY Dreamer. Thanks for letting me know! New follower! Thanks so much! If you do...please post pics to our FB page! Thank you for your kind comments! I haven't forgotten about you, just got really busy. I will touch base a bit later this week! What a transformation! I had no idea you could do something like this with paint! Sorry I am just now getting back to you. I will check out your blog and hopefully share...if I haven't missed it! Thanks for your kind comments and stopping by! It will be interesting to see how this wears, and what points you may need to touch it up. Or is it more of an accent chair rather than one you would use everyday? I do know of chairs covered in gesso, the paint like material that is used to cover artist's canvases to fill the weave. I don't know how they have worn, but with plain white gesso, it would be easy to keep touching up. Keep us informed on this one please. Thanks for stopping by. At this point, to my knowledge it shouldn't need to be touched up. The paint is all natural so it actually soaks into the fabric vs. sitting on top of the fabric like an acrylic or latex would. I then waxed the fabric with an all natural wax (CeCe's as well) which acts as a sealer. Then followed with the Satin Finish, again all natural and water based. It did seal the fabric and provide a water repellant surface. As of right now the fabric is very pliable and soft. It was meant to be used, not just an accent piece. I will try to post an update later as to how it is wearing. I have never tried gesso on a fabric item that I would be sitting on? I would agree..that would be easy to touch up. Thanks again! Thanks for sharing your success story. I have been wanting to try this and was searching for tips on how to achieve the best results. You have inspired me to get on it.